SDXC (Secure Digital Extended Capacity) standard was first introduced in spring 2009 at CES by SDA (SD Association). Already the dominating memory card standard, SDXC is an upgrade revision of its successful predecessor SDHC (Secure Digital High Capacity) to accommodate rising demand of a faster and higher capacity memory module. While SDXC may have seen promising to become the next mainstream memory card standard, is it really as good and as fast as they say it is? At the maximum storage capacity up to 2TB(2048GB), SDXC has a breakthrough read/write speed up to 104MB/s (and theoretical speed up to 300MB/s) to meet the needs for faster file transfer. A brand new UHS-1 (Ultra-High Speed Bus 1) design structure was therefore implemented for a major speed upgrade. In addition, it also supports the latest exFAT format which has significantly increased the file compatibleness among the applicable devices. Does SDXC really perform as well as it claims? While SDXC modules are still rare in the consumer store, three top brands of the SDXC modules were managed to be found on the counter and used as the test devices in an intended test environment – they are SanDisk, Panasonic and TOSHIBA. All of the modules have 64GB memory and specified in Class 4 or Class 10 (minimum transmission speed to be up to 4MB/s or 10 MB/s respectively). TOSHIBA module is the only one specified with UHS-1 specification, and is supposed to have better performance. 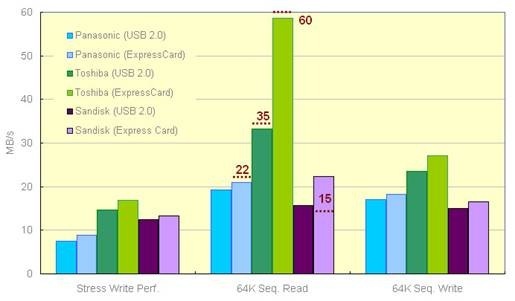 The test was conducted with a unique diagnostic tool along with two SDXC supported host devices(card readers) with distinct interfaces; the selected modules would have to undergo the so-called “Data Integrity Test”, “Media File Stress Write Performance Test” and “Read/ Write Performance Test” developed by Allion. Through the study of real-life user scenarios and their actual behaviors, several types of files with different sizes were selected as the test files; these have included the formats in graphic image, audio and video. Up to total of 12 file types under 130 file sizes (from less than 1MB to up to 400MB) were used as the content for file read and write. The result, all of the modules were able to sustain 100% data integrity and there were no data loss or error after between 30~80 rounds of continuous file read and write. The purpose of this test is to verify the true performance of the SDXC standard. In order to precisely measure the write speed performance, we have chosen two SDXC/UHS-1 supported Card Readers (with different interfaces including USB 2.0 and ExpressCard with PCI-e) over the conventional devices such as Digital Camera, DVR or any similar product to avoid the variables derived from device’s DRAM buffer, hardware & firmware design limitation and more influencing factors. After 30 consecutive rounds of file copying test, we were able to see the obvious difference in performance. 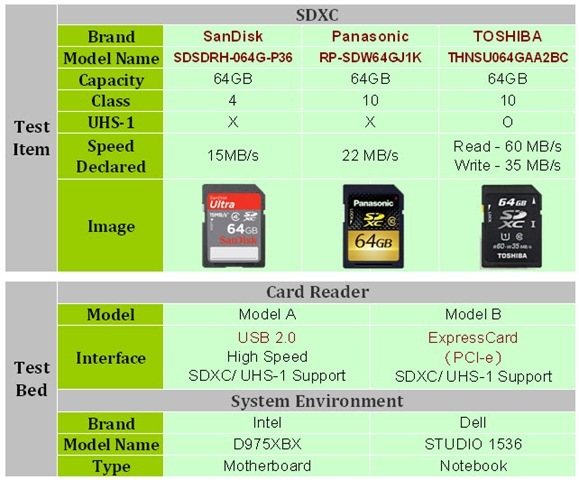 While each module claims to be SDXC with 64GB capacity, a Class-4 SanDisk module has had significantly higher speed than the Class-10 Panasonic module. And the highly anticipated Toshiba UHS-1 is also twice the speed of the Panasonic module (see data shown above). Panasonic, which claims to be a Class-10 module, has major underachievement with either Card Reader in this test category. As to the overall writing stability, all three modules tested have demonstrated similar result under 10% of range in difference. Along side using the Card Readers for writing assessment, a series of files varied in formats and sizes (4KB, 16KB and 64KB) were also utilized in random read and write tasks simulating real life user behaviors. Because 64K is the most common file size used in general, therefore 64K files would be used to generate the test data under this test category. 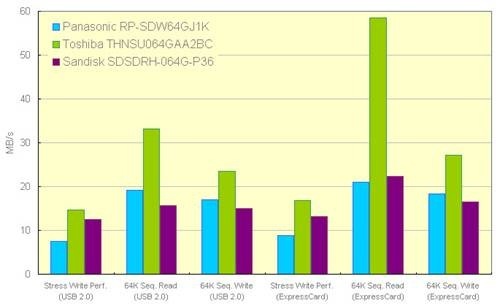 Through test data, we can see Toshiba SDXC module excels in both read and write speed under either Card Reader. 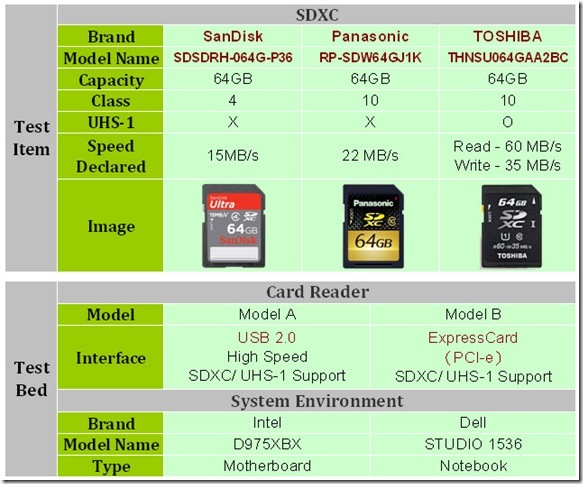 According to the test result from Card Reader A, SanDisk SDXC module has achieved 15.65MB/s in file read, whereas Panasonic is 19MB/s and Toshiba is 33.24MB/s. As to file write, SanDisk has achieved 15.03MB/s, Panasonic 17.05MB/s and Toshiba 23.56MB/s. On Card Reader B, the average file read speed for SanDisk is 22.31MB/s, Panasonic 20.94MB/s and Toshiba achieved an impressive 58.56MB/s. As to file write, SanDisk is 16.46MB/s, Panasonic 18.29MB/s and Toshiba again, an outstanding 27.13MB/s. Despite the fact that Toshiba module has shown slight speed variation under each test round, all three modules tested have shown greater stability in file read than file write. Our test result has shown that the Panasonic module has failed to achieve the minimum speed requirement of 10MB/s which was defined by SDA. While SDA has defined clear set of design and product specifications for the developers to follow, the consumers would not be able to identify quality level through the appearances of the product themselves. All of the modules selected claimed to meet the SDXC standard (in Class 4 or Class 10). However, the actual read/write results are distinct from the definition of their designated classes. 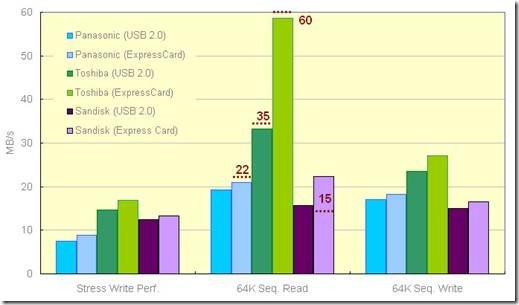 From the chart below, we can see the performance results varied through two different card readers used. A Class 4 SanDisk module has outperformed the Class 10 Panasonic module in stress write speed, and there is no obvious difference in sequential read speed between the two. Toshiba’s UHS-1 module turned out with no surprise leading the performance in all test categories including a significant sequential read speed. Media Read/Write Performance Test Assessment: Toshiba outperformed others in all test categories. While all three modules were able to meet the performance claims in Media Read, but have under achieved in Media Write. Asides from the Read/Write Performances, one of the most important factors for the consumers is how well the module can retain data. We are glad to report all three modules tested have not shown any data loss or data corruption under our Data Integrity Test. While there are only limited SDXC products available in the market today, therefore Device Interoperability Test has not been included as one of our test categories this time. We can only hope the manufacturers would pay more attention in the interoperability issue through time when more and more SDXC Modules and Hosts begin to emerge. The complex level of product specifications can be overwhelming to typical consumers in the marketplace today. Device compatibility is also often neglected by the consumers during the purchase. A high performance memory Module would not achieve its highest potential with a wrong reciprocal Host. As to the manufacturer, any component used in a memory module such as the NAND Flash and Controller can be the key factors influencing the overall performances. In order to sustain the product quality and product claims, a thorough verification in product design, firmware revision and performance claims are required throughout the development stages and before the mass production. A comprehensive test plan for the product can effectively protect the brand image and lower the risks in return and recall. 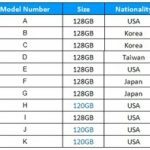 Despite the product claims printed on the package of each SD cards, the actual results can be unexpected and there is currently no way of guarantee to the buyers. There are currently renowned standard bodies such as USB-IF SATA-IO, Bluetooth-SIG, Wi-Fi Alliance and more appointing Independent Certification Vendors (ICV) to conduct the tests for products that intend to bare logos. 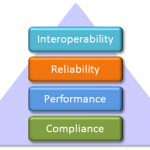 This is to reassure product performance and claims for the end users. We can only hope SD Association would follow the same guideline in the near future so that mass standards such as SD/SDHC/SHXC can be clearly defined, and thus, this adds more benefits and convenience for the consumers and more confident values for the product manufacturers.